Crocodile Nest Bed & Breakfast Accommodation in Nelspruit, Mpumalanga. We provide a selection of rooms, from rondavels (traditional, round and thatched rooms), regular bedrooms through to comfortable timber sleeper cabins. We are based on a working citrus-exporting farm right alongside the N4 Highway, and only a few minutes from the Nelspruit CBD. The B&B lies within the expansive, peaceful and bird-filled garden of the farm homestead. 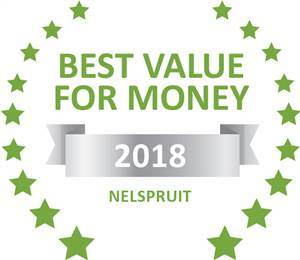 Based on reviews of establishments, Crocodile Nest Bed & Breakfast has been voted Best Value for Money in Nelspruit for 2018. "It is difficult to sum up our wonderful experience while staying at this heaven on earth. Hospitality gets a new meaning at this place. The deja-vu feeling that you belong to this place needs to be seen and experienced. Did we miss home once in this place? Na! Not at all! Looking forward for our next stay." We have had a wonderful time here at Croc Nest. Its serene, peaceful and beautiful. Would luv to come again. Sozi is really helpful. "Dear Beril and Marc, Thank you for your welcome and for being so nice. Your dinner is very perfect and your swimming pool is beautiful and I had fun with my big sister. My mum loves your garden and I love your dog, they are very cuddly!